Say that once, and the congregation is stunned. Say it twice, and a group will rise up to make it a reality. 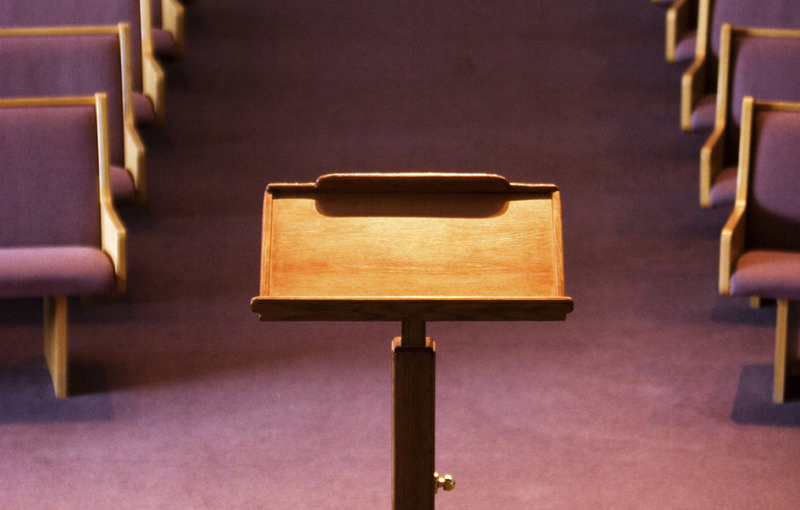 The truth is every pastor should function as the resident theologian for his congregation. If you say, “Thus saith the Lord,” your next words had better be Scripture. Show some class, preacher, and do not bring arguments into the congregation where they will divide the body and where you have an unfair advantage. I’m sorry to say, friend, it’s been said before—supposedly in jest, followed by a bit of silliness. But this has no place in the pulpit. Such a preacher deserves all the trouble he’s going to get when he returns home. Can you say “manipulative”? File this foolishness under the heading of taking the Lord’s name in vain. Confess such failures to the Lord, but the congregation does not need to hear this. Never give a congregation an ultimatum, or you will find yourself on the losing end of that proposition. Never tell the congregation you’re almost through. They will not hear another word you say. But if you do, keep your promise. Some may debate whether to pulpit is the place for jokes, but, regardless, it’s almost always true that one you impulsively grab on the spur of the moment will get you in hot water. No pastor makes these decisions alone. This statement is a direct challenge to some, friend or foe, who think the minister’s tenure should have an expiration date at some point. Why would a pastor want to berate people for coming to church? Instead, welcome them and give them reasons to return. JOE MCKEEVER (JoeMcKeever.com) has been in ministry for more than 50 years. He has been writing articles and drawing cartoons for religious publications more than 40 years. These are good, but I’d show some grace on #2. Amos said, “I’m not a prophet, nor the son of a prophet.” It was an expression of humility and recognition that his presence before the king was not because of who he was or what he had done. I don’t know anyone that would tell Amos, “then shut up and sit down,” nor would they remove him from the list of minor prophets. Often when a preacher says this, it’s intended to be an appropriate acknowledgment of humility and utter dependence on the Spirit. Of course . . . if it’s meant to reflect a laziness in studying in preparation to preach God’s Word, then it’s the same as #7. Depends how you define theologian. Many people see them as stuffy and like the crew that was debating the color of the Blessed Mother’s eyes while people were dying in the street during the overthrow of Constantiople or discussing other issues not pertinent to living in the nasty now and now. They speak in terms only other theologians can understand and leave people in awe of his oratorical skills and knowledge of Greek, Hebrew and Aramaic assuming that it must have been a good sermon though they got very little out of it. By that definition, I am no theologican and glad of it. Theology is not dry, fruitless arguments about minute points of doctrine. Any time we think about a teaching of the Bible and strive to understand it, we are engaging in theology. #3. I disagree. The next words out of your mouth should be in agreement with Scripture. The Holy Spirit still speaks today. The Holy Spirit speaks through the bible today, and if the Holy Spirit is still speaking apart from scripture then are we to add to the bible every time He speaks or why do we even need a bible if He is speaking directly to people? My prayer is that the Holy Spirit talks with my pastor and me daily. My God and the Holy Spirit are not dead! They continue to communicate with me consistent with my Holy Bible. All good points, I agree that #2 is a bit iffy, but he ought at least be the most theological in his congregation (or try to be- I’ve had professors in my audience and its a bit intimidating). But #3 Is SPOT ON! Agree .. this is great, great great!… thank you. yes i also think what Fred says can be true.. but even in speech class we learned to never say “i am not prepared ” or “i am not so smart” etc… Since i now spend my life helping young Asian men become teachers and Pastors i tell them often.. not to say that.. just preach the Bible.. even when we are called on the spot and have no time to prepare.. It’s God’s Word…The better prepared we are is great..
#7-My former pastor used to regularly admit that he had finished that morning’s sermon during his walk earlier that day. One of many reasons he’s my former pastor. If he came across as unprepared then yes. There are many pastors who remain open to the Holy Spirit even while they are preaching and I assume that there are many who are not completely done preparing their sermon until ten to noon. I am an ordained minister serving full-time in a congregation. There are many times my sermons aren’t written until a few hours before the service: I have other duties to attend to (teaching catachism; counseling; funerals; emergencies; fundraisers; and family commitments…to name a few). I too have had a few members complain because they think they are being short-changed when this happens, but NONE of them point to any details in the sermon that could have been said better etc. In other words, they don’t listen to the content of the message because they are INTENT on saying something negative or finding fault. This is very evident when I preach a sermon they say “they really liked”, and I secretly know I only wrote it hours earlier. The sermon isn’t “due” until the time it is actually to be preached in the pulpit. Your comment is based on a false assumption, that a sermon written several days earlier is better than one written a few hours earlier. If your comparison is to preachers on TV, you must understand their sermons are almost always written by a team of ghost writers, and they do NOT serve congregations by doing hospital visitations, teaching, counseling, etc etc etc. If you CAN point to something in the sermons that could have been said better etc., then you have a point worth raising, but if the only thing you can say is that it was written “late”, then I question your motivation. I have a parishioner who actually timed my sermons and based their comments on that, or, in other cases (at funerals) how many sentences I devoted to speaking about the deceased personally. They actually sat their and counted, then went to the Council because I said a few more sentences about the deceased in one funeral and less in another. My apologies, the comment was directed at “Cassa”, not “Brother Pete”. Thanks, very much. Good and Godly advice! Also, a pastor should be careful to prejudge people. There’s was an incident where a pastor was upset with certain people about showing up only to Sunday services. I was one of those people and it really bothered me, because I work weekdays 3-11pm. I have a family and I can’t just quit my job or settle for a $9 an hour job. I’m praying about it, but one has to wait on God and not do things without His direction. After all, no one else pays my bills or supports my family. You should be glad he wants people there. If a coach says the kids need be at practice, of if a church softball coach says the adults need to be at practice to play, everyone views that coach as saying what he should say. Let a Pastor say everyone should be in church and people loose their minds. And that my friend is a fact! 1. People who live in glass houses should never throw stones. 2. I’ve been here long enough to know the skeletons in all your closets. 3. Unless you have walked in my shoes, keep your criticisms to yourself. #5 “My husband is so dumb….” is equally egregious and not recommended. the congregation . need not know your political choice or how dumb you think the opposing party is…….we can get that from the various opposing medias outside the church. We come to church to worship God and hear His word. We, the ministers of Jesus Christ must at all times show the Love of God. It is our responsibility teach only what God wants us to teach. It is never your job to point out anyone in the church, to personally embarrass them or cause hurt. As a pastor, it is your responsibility to teach them about someone who loves them more than anyone else.To show them that no matter what you are going threw God is there with you and so is the church. Sometimes we say things to try to help members to understand that we are all in the same boat, trying to make it to heaven and some times we miss the mark( we are human too) The time it takes to do a sermon depends on what the Holy Spirit wants you to say. He can change a well written sermon the moment you step in the pulpit. That’s why we have to always be prepared. As ministers of the word of God we should never cause confusion. Our job is to show love ,joy, and peace and it starts with us.